If you're a regular reader of this blog, you're probably aware by now that we produce a lot of educational material about continuous improvement methodologies, leadership, engagement strategies, and how to spread an improvement culture. We have a regular webinar series, producing new videos a couple of times per month, we have a set of awesome educational videos discussing best practices for continuous improvement and a library of eBooks we've written on these topics. Today's blog post is an excerpt from our latest eBook, An Introduction to Continuous Improvement Software. The foundation of continuous improvement is a cycle of capturing opportunities for improvement, implementing them, measuring the impact, and sharing knowledge. With time and dedication, that cycle becomes self-sustaining as success inspires greater engagement, and a culture of continuous improvement spreads throughout an organization touching every process. The cycle of capturing opportunities, implementing them, measuring them and sharing them is built upon three critical elements: engaged leadership, a consistent improvement methodology, and enabling technology. Every single organization that has come to us struggling with establishing or maintaining an improvement culture is failing to nurture at least one of these three components, for one reason or another. Leadership, methodology, and technology support each other in an intricate, codependent dance that has been mastered by the best continuous improvement organizations. Continuous improvement experts agree that the support of leadership is the key factor in the success of a continuous improvement program. This makes perfect sense. If an executive or a manager doesn’t feel it’s important, employees -- who feel pressure to make themselves appear valuable to those leaders -- will eventually lose interest as well. Apathy will also spread if leaders don’t demonstrate that they are behind the initiative by offering guidance and support within the organization to make change. If there is a lack of support for a continuous improvement program to be implemented, those implementing it will only be able to work on a series of isolated efforts. Since we know leadership behaviors will make or break an improvement culture, the question becomes, how do we empower leaders to engage and support employees without demanding more of their already overburdened time? The answer is simple, a reliable methodology and the right technology. Establishing a methodology gives leaders a common language and procedure to empower, engage, and support employees in the process of improvement. This, in turn, accelerates improvement, engages more people, and maximizes impact on improvement efforts across the board. At KaiNexus, we are often asked how an organization will know when it is the right time to implement a continuous improvement methodology. The answer is always clear no matter what type or size of organization asks; the right time is now. This often spurs a storm of “but” statements, which also always get the same response; there’s never going to be a perfect time to start, you just should be willing to try. A desire to engage employees and colleagues in continuous improvement is the critical first step, and you don’t have to wait to take it until you have your entire journey mapped out. The truth is that no person or organization is an expert in continuous improvement when they first get started. They just act and are willing to continue working toward their goals, gaining experience and mastery along the way with every success and failure. Continuous improvement is a skill that you develop through practice using just your commitment to the process and the knowledge of the existing methodologies that you gain slowly along the way. If you think you have more to do before choosing a methodology and getting started, or that your existing culture of improvement isn’t strong enough to support implementation, you should reconsider. We never hear from those who have implemented a continuous improvement strategy that they wish they would have waited longer before getting started. However, we often hear leaders tell us that they wish they had started sooner. Simplicity in implementation of your chosen strategy is key for employee buy-in. By establishing a methodology that is simple enough for everyone to participate, you eliminate barriers to engagement. Put another way, if it's too hard to participate, no one will. Consistency in expectations, goals, and processes ensures that everyone is speaking the same language for a unified improvement culture, which in turn increases collaboration and the potential for improvements to be made. Ensuring that improvement is an important part of everyone's daily work is vital to growing an improvement culture. It also ensures that opportunities to improve every task, done every day will be captured. Technology is what enables leadership to engage in the improvement process, and it’s what enables them to provide a simple, consistent, and disciplined improvement methodology without adding to their workload. When it is built to support and maintain continuous improvement, technology empowers employees to log ideas and issues, which in turn lifts the burden of improvement off managers while increasing transparency and communication with staff at all levels. By being able to both access information and offer support and guidance in one location, leaders can easily become engaged in the improvement process, at the same time fostering an understanding of how each improvement contributes to organizational goals and addressing areas of concern immediately before they lead to wasted resources. Giving your team a single place to go for all their improvement information, and therefore a single method for logging information, makes sure files are organized, easy to find, and up to date. This all helps simplify processes for both managers and staff. 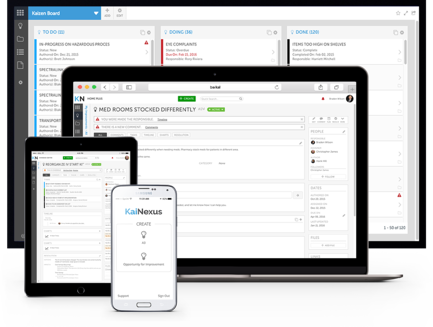 KaiNexus has given us a vision of what's going on across our organization that we've never had before. This transparency brings more opportunities for improvement, more work that we could be doing, more coaching that we could be doing. It takes a lot of the burden off the manager and increases communication and transparency across the organization so that everyone can see what's being worked on and the manager doesn't have to carry all that. Innovation and improvement management software that is simple enough for every employee to use will help any organization to create and sustain a culture of continuous improvement if it’s powerful enough to offer real value to leaders and improvement specialists. Such management platforms facilitate transparency, accountability, and collaboration. Even the act of deploying improvement software demonstrates to employees a commitment to the improvement methodology by providing a platform built specifically to support it, which in turn kicks an organization’s improvement culture into high gear. The right software platform makes it easy for people at all levels of your organization to see and participate in continuous improvement, regardless of where or when they work. Getting started managing your work in such a platform from the beginning will provide you with a solid foundation to build upinon as your culture of improvement spreads, and give you the impact and engagement reports you’ll need to secure leadership buy-in. The more people you’re involving in your continuous improvement program from all levels, the more critical software becomes. We will cover what features continuous improvement software we’ve found drive change faster and more efficiently later in this eBook, but it’s important to note first that an organization needs effective leadership for a culture of continuous improvement, and that those leaders will fail without an improvement methodology and enabling technology. The technology you choose should help you create and implement a consistent methodology, which will create momentum in your improvement culture. That's it for now, download the eBook to read the rest!